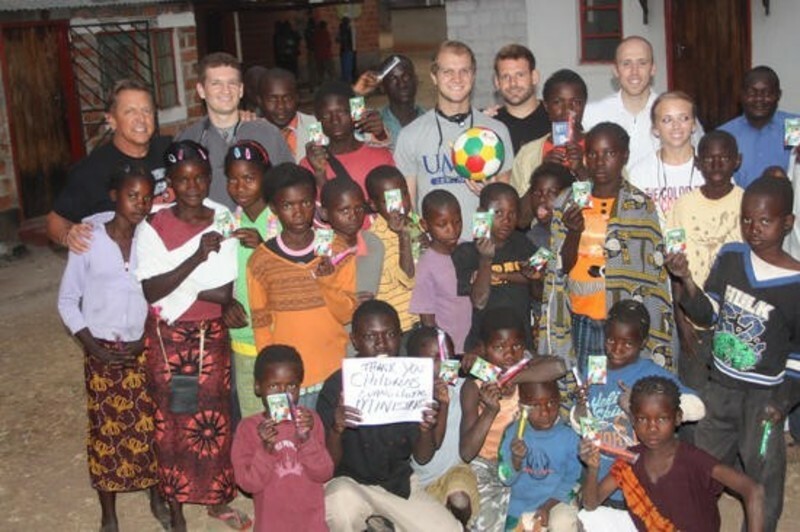 With a desire to serve children both nationally and around the world, a Moundville couple began a ministry that provides colorful soccer balls and other items to churches or other groups and individuals ministering to children, whether in the United States or in other countries. Mike and Betty Morris worked with the Children Evangelism Fellowship for 20 years before they followed a new vision in 2004, which led to their finding of the Children's Evangelistic Ministries, Inc., which in the past decade has led to their colorful, Energia! items being spread to more than 125 countries. After using the "Wordless Book," which uses the colors of black, red, white, yellow and green to tell the story of Jesus, Morris said he began to envision using those colors on soccer balls to be given to children. "The Lord gave me the idea and it's expanded into several products," Morris said. What started with about a dozen black and white soccer balls that Morris covered with colored vinyl has expanded into about 35,000 soccer balls being distributed, as well as further products such as bracelets, footballs, basketballs and key chains, which can be used in sharing the story of Jesus Christ with children while also providing toys for them. When their first shipment of 500 soccer balls arrived, Betty said they and others prayed that 100 people would hear and accept the story of Jesus with every soccer ball they sent out. That prayer has been answered over the years as churches, organizations and individuals use the Energia! products, named after the Spanish word for power, around the world. Morris said they run their ministry out of their home, referring to their dining table as their office, selling the resources or donating them when they are able. He and his wife live on a farm where they own cattle and also remain active in the community, with Betty serving as the financial secretary to the First Christian Church. "That's enough to keep me as busy as I'd like to be," Morris said, but added he enjoys the work, although he has not been able to do as much traveling recently due to heart trouble, which has led to four heart attacks and seven stints. But even in those situations, Morris said he has been able to make contact with others through their ministry, such as a medic who was also a pastor and eventually used some of Morris' Energia! products on an international trip. Those products have made their way into dentists' offices and other businesses locally as well as internationally, being placed into the hands of the mayor of Bethlehem, Israel, with young adults involved in soccer tournaments, and children in Brazil, India, Korea, Russia and numerous other countries. "You just never know one day to the next who you're going to meet," Morris said. "It's just amazing what the Lord's done. It's by His grace that we're able to do what we've done." On a regular basis, Morris said he receives emails or letters from adults and children who have used the Energia! products on international trips or more locally. "Meeting new people ... is about the greatest joy I have," Morris said, saying he enjoys making contacts around the world and serving children through the products, which have earned him the nickname "soccer ball man." Those interested in learning more about the ministry or the Energia! products can find information at their websites, www.childrensevangelisticministries.org or www.energiaproducts.org.